A full three years and one month after the posting of Combat #1, we have finally found a copy of the second issue. Rumored to have been almost completely confiscated by RCMP officers the day it came back from the printers, Combat #2 is one of the rarest publications on our site. Our thanks go out to everyone who helped us track it down. While this issue is far less ambitious than the first issue of Combat, its real problems are the actions that it is covering. 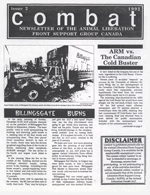 Both cover stories were public relations disasters for the animal liberation underground at a time when direct action was already in decline, and one was a disaster for the non-humans it sought to save. The Cold Buster contamination hoax, like all contamination hoaxes before and after, was mostly successful in convincing the world that animal liberationists were willing to target the public and risk killing random consumers. These hoaxes do generally cause large amounts of financial damage- but none of them has ever stopped a product from being animal tested and it is difficult to believe that the benefits outweigh the costs. When the Animal Rights Militia announced a week after the initial scare that the contamination was a hoax, the media barely paid attention. The Billingsgate Fish Market action was even more tragic. The action itself involved economic sabotage and arson, both defensible acts against the capture, confinement, and killing of non-humans, except that in this instance fire was set to trucks which were parked directly against the building itself. The flames caused a short circuit to the building’s electrical systems, halting pumps to crab and lobster tanks inside. More than a dozen were killed. While it is true that those animals were already slated for death, it is still unconscionable that their lives were cut short by animal liberators. This isn’t to say that there is nothing redeeming about this second and final issue of Combat. One of the original messages from the Western Wildlife Unit is presented here unedited, and there are also rare accounts of some of the last major hunt sabotage actions in the United States. We are happy to have saved this publication from obscurity and to make it available once again here on TALON. After 6 years of operation in Toronto, a lull in activity caused the ALF Supporters Group Canada to shut down. Other volunteers picked up the slack and soon the SG was moved to Alberta. At this time the ALF was fairly active in the great white north, and soon their night time activities were being covered in a new magazine known as Combat. 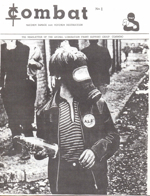 Considered by many to be the predecessor of Underground, Combat closely followed the template for supporters group publications set by The SG in England with one important difference: They had awesome cover art! Combat is amongst the most rare militant animal rights publications produced in North America, and when we received this first issue for scanning we were delighted to find, a long, and thoughtful prison letter from Ronnie Lee, updates on the arrests of Jonathan Paul, Bill Keogh, and Cres Velluci, and a short listing of international action reports. There was also a hastily added pamphlet stuffed inside with an update on the jailing of Henry Hutto, an early movement hero who was amongst the first members of both PETA and Earth First! Very little information is available about Henry, who passed away in 2003, but he is a minor legend in some circles and the pictures of a rally held in his honor made holding this magazine that much sweeter. 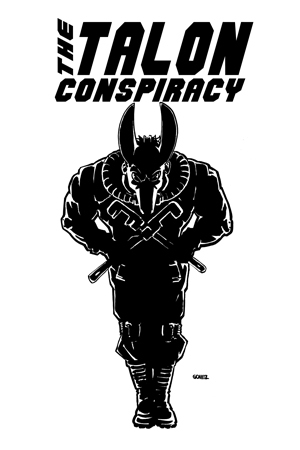 Issue #2 of Combat is now available HERE.